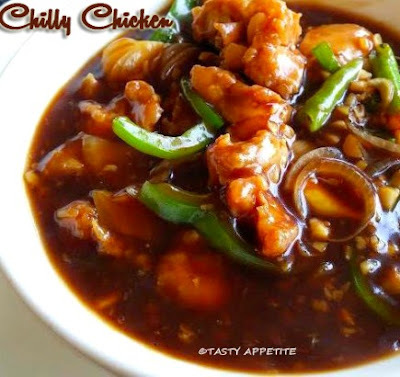 Here goes the most easy & delicious chilly chicken gravy recipe. In this recipe, boneless chicken cubes are marinated, fried and seasoned in spicy tangy sauces to get the best Indo-Chinese taste. It combines excellent with fried rice, chapatti, poori, roti and noodles. Try this popular recipe and enjoy the garlicky chilly luscious gravy recipe. 1. Wash and chop boneless chicken to small pieces. 2. In a mixing bowl, add all purpose flour, corn starch, soy sauce, salt, ginger garlic paste,vinegar and finely sliced green chilly. 3. Add little water and make it a paste. 4. Add the chicken and coat well with the paste. 5. Allow to marinate for 30 mins. 6. Meanwhile chop onion, green chilly, capsicum and set aside. 8. Once the oil is hot, add the marinated chicken pieces. 9. Deep fry until both the sides are brown and crispy. 10. Drain in kitchen tissue and set aside. 11. Heat 1 tbsp of oil in a pan. 12. Add grated garlic, green chilly and toss. 13. Now add ginger paste and saute for a minute. 14. Add cubed onions, capsicum and saute in high flame. Take care the veggies should retain their crunchiness. 15. Add soya sauce and mix. 16. Add red chilly sauce, tomato ketchup and salt. 17. Add vinegar and sugar. 19. Now add the fried chicken pieces to this thick gravy and mix well. 20. Sprinkle finely chopped green onions. 21. If you want chilly chicken dry, then at this stage you can turn off the flame and transfer it to serving bowl. 22. To make gravy, add 2 tbsp of corn starch to small bowl, add enough water and mix it to thin paste. 23. Add this corn starch paste to the chilly chicken and keep the flame in low. 24. Stir well for few minutes and turn off flame. 25. 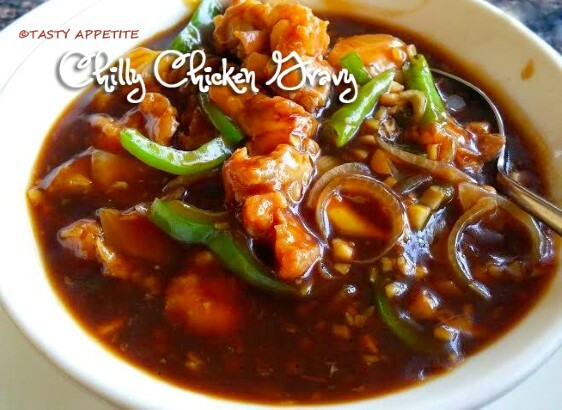 Lipsmacking delicious restaurant style Chilly chicken gravy is ready. 26. 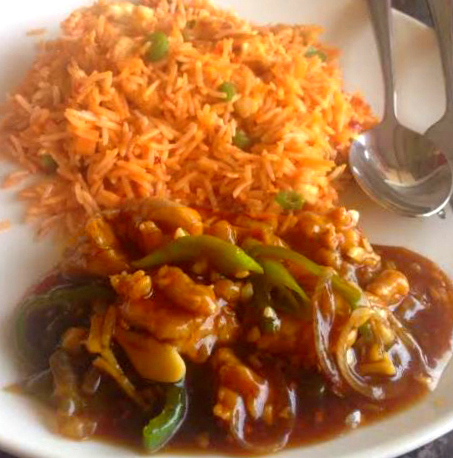 We enjoyed hot with spicy Schezwan fried rice. Wow!!! That looks mouthwateringly delicious! !